Welcome to my "Bright Eyes" cat prints webpage. These watercolors celebrate the beauty and color of cats. I am a professional watercolor artist who specializes in painting animals, and I use a technique that I developed as a result of taking several art classes, including botanical illustration at Chicago's Field Museum of Natural History. My technique incorporates many layers of transparent watercolor, in some cases up to 20 layers, which is very time consuming but also very rewarding. Below are some of my cat limited-edition prints. They are high-quality 4-color offset lithographs professionally printed on acid-free paper. Each image was produced in an edition limited to 950 signed-and-numbered prints. Image size of each print is 4.25x7.25". Framed prints have outer dimensions of 9.5 x 12.5" -- perfect for that small area in your house or office! To purchase this print, please call. 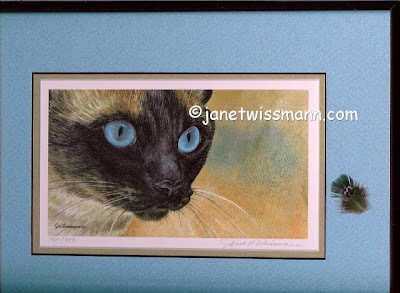 This painting by Janet Wissmann shows a beautiful, bright-eyed calico cat in the picture, which is framed and matted up nicely. The pheasant feather in this painting echoes the constricted pupils of the calico cat. FRAMED PRINTS: $50.00 EACH -- INCLUDES SHIPPING! To buy one of these framed prints, just give me a call & I'll place your chosen print aside until your check arrives. My phone # is 608 624 5511, available 9AM to 9PM Central Time. Thank you for visiting this page, and enjoy the cats! If you don't see a mat color you would like, let me know and I can make one for you! $50.00 EACH for a FULLY-FRAMED PRINT! THIS FEATHER IS THE SAME SHAPE AS THE CAT'S PUPIL - very artful! Each colorful painting of a cat's face shows the remarkable colors of a cat's eyes and the intense expression of a cat as it's looking at a bird. A lovely smiling cat painting, showing a white cat with a black nose and black chin, and framed with a real feather. It's a lovely white cat picture, complete and ready to hang on your wall. This particular one has been sold but I leave the picture up here because it is a pretty combination and I can mat one up for you, with this color light green suede top mat, black rag inner mat, green Amazon feather, and black (not green) satin frame. Just ask. Janet Wissmann has painted a beautiful close-up picture of a calico tabby cat with green and amber eyes. It's framed here with a striped real feather that mirrors the cat's own tiger markings. Janet Wissmann is best known for her animal portraits, and these cat watercolor paintings really show the personalities of cats. Bright Eyes II -Siamese Cat print, Number 150/950. Click on images to enlarge and see detail. Frame is satin black. Feather is from a pheasant, with tinges of blue at the tip. Shipped with glass, ready to hang. Four lovely Bright Eyes prints matted with blue top mat. WOW! Really brings out the color of the eyes! This includes four ltd.-edition, signed Bright Eyes cat prints (w/matching print numbers), professionally-cut double matting, hinging of artwork, and backing board. All you need to do is add your glass and your frame at your end. A few feathers will be included so you can position them however you like under the glass when you frame your piece. Finished size is 12.5 wide x 29" high. Top mat is blue, inner mat is black. All acid-free materials. ← BLUE-MATTED / 4 BRIGHT EYES PRINTS, $100 plus shipping (shipping will be about $18-$22 ...depends on your location). Includes feathers. This price does not include frame or glass. Please call to purchase this item -- you can pay with a check, or you can pay with MC or VISA thru Paypal. Frame: If you would like a black satin aluminum Nielsen frame, as shown in photo, add $50 to cost above. Frames are easy to assemble with screwdriver. Glass this big cannot be shipped safely so you will still need to add the glass at your end. Three Bright Eyes prints framed with dark rust suede mat, satin black frame, and three feathers. Click picture to see fine detail. 30.25x9.5 inches outer dimensions of framed piece. Will be shipped without glass (or picked up with glass). $105 plus shipping costs. YOU WILL RECEIVE THE EXACT ITEM SHOWN IN THE PHOTO. Please call to purchase. Phone number at top of page. Check, Visa, Mastercard accepted. WANT 3 DIFFERENT CAT PRINTS MATTED LIKE THIS? I can mat ANY three of my cat prints in a similar manner for you as shown above. I would suggest white or black matting for such a venture because it goes with any of my 8 Bright Eyes prints no matter what their color themes are. Price would be $85 plus shipping (shipping will be around $15-20 depending on your location). Price does not include a frame or glass. I will provide a few feathers so you can arrange them as you like when you frame the piece at your end. Frame/glass size you will need is 30.25 x 9.5"
My Bright Eyes cat prints are signed & numbered offset lithographs, expertly made the old fashioned way, printed on a printing press using ink and fine, acid-free paper. They are not cheap inkjet prints! To view each print closely, click on any of the framed pictures here on this webpage. All unframed prints get free shipping to anywhere! To order a single print or the full set, please order using the buttons at the top left of this web page. Or you can call to order if you want to mail a check. Black and white cats, jellico cats, and other breeds of cats may be in Janet Wissmann's future as well. Birman and Burmese are particulary of interst to the artist Janet. Janet's cat art prints are limited-editions entitled "Bright Eyes". There are eight prints in the series. Each fine art cat print can be framed with a real feather, or can be purchased already matted and framed, each with its own real feather. Feathers range from guinea fowl feathers to colorful pheasant and chicken feathers. Some of the feathers with these matted cat fine art prints are from domesticated parrots, such as Yellow-fronted Amazon parrots, African Gray parrots, Scarlet Macaws, and Blue and Gold Macaws. The cats pictured in Janet's limited-edition, signed cat art prints and cat watercolor paintings range from purebred Siamese cats and Himalayan and Persians, to colorful barnyard calicos and orange and ginger tiger cats. Mackerel tabbies and white cat with black chin are also found in the set of cat art prints by Janet. Feathers are real bird feathers! These will be shipped with glass and come ready to hang! Prints are high-quality OFFSET LITHOGRAPHS printed on archival paper. Each print is signed and numbered in pencil by the artist Janet Wissmann. Only 950 of each image were made. Framed size 10 x 13"
Copyright shall at all times remain vested in the Artist. No part of the work may be otherwise used, reproduced, stored in a retrieval system, or transmitted in any form or by any means electronic, mechanical, printing, photocopying, recording or otherwise, without the Artist's express written consent.